16 November 2014, Dhaka. On 6 November 2014, BRAC Uganda was recognised for its financial reporting system when it became the first runner up in the NGO category at the 2014 Financial Reporting (FiRe) Awards-Uganda, at the Kampala Serena Hotel. BRAC Uganda has participated in the FiRe awards for the past three years, and has been recognised as the best NGO in both 2011 and 2012 and became the first runner-up in the same category in 2013. This year, BRAC Uganda competed against 16 NGOs’ and 75 various sectors such as banking services, consumer and industrial products, education institutions, insurance services, the public sector and regulatory bodies and associations. BRAC Uganda country representative Md Abul Kashem Mozumder, programme manager for microfinance Md Rafiqul Islam and country head of accounts Daniel Businge represented BRAC at the event and received the trophy and certificate. The guest of honour at the event was the Speaker of the Uganda Parliament Rebecca Kadaga, and she was accompanied by the Minister of Finance, Planning and Economic Development Maria Kiwanuka. The FiRe Awards was inaugurated in 2011 with the aim to promote a standard financial reporting system in compliance with the International Accounting Standards Board (IASB). 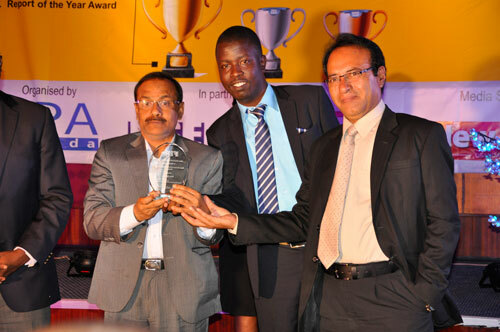 The awards are organised by the Council of the Insititue of Certified Public Accountants of Uganda (ICPAU).